The country’s foreign policy has shifted significantly since the elections. Will that continue? Sri Lanka’s geostrategic position has made it the target for diplomatic courting from a range of regional players, including China, India, and Japan. Under the tenure of former Sri Lankan President Mahinda Rajapaksa, Colombo had catered especially to China and openly accepted Beijing’s development assistance in return for China’s development of major maritime ports. These plans and the friendly policy toward China have been altered since the election this past January of Maithripala Sirisena, ending the reign of the once powerful Rajapaksa. The Sirisena administration has shown no hesitation in changing the pro-China policy of Rajapaksa while also looking to repair the damage done to Colombo’s ties with the United States, India, and the European Union. The temporary suspension of the Colombo Port City project was one of the initial moves of the new administration. In addition, other mega projects funded by Beijing were also halted and tenders were cancelled. For example, the Sirisena administration suspended the execution of the Northern Expressway until a proper investigation is conducted in determining whether the Rajapaksa administration had inflated the costs of the project. The South Asia Analysis Group, an Indian think-tank, had portrayed the Lotus Tower as a façade that may conceal China’s “assassin’s mace” weapons, given the involvement of China National Electronic Import and Export Corporation (CNEIEC) and the Chinese Aerospace Long-March International Trade (CALMIT). Realizing that such moves may have adverse repercussions on the “strategic cooperative partnership” between the two countries, China’s Assistant Minister of Foreign Affairs made an official visit to Sri Lanka from February 5 to 7, 2015 as a special envoy of the Chinese government. Moreover, to accommodate Indian concerns over the growing strategic relationship between Colombo and Beijing, Chinese President Xi Jinping has talked up a trilateral partnership between China, India, and Sri Lanka. Despite this, relations between Colombo and Beijing were dealt another setback after the Sirisena administration recently declined to grant permission for Chinese vessels to dock in Sri Lanka. Given the growing rift between China and Sri Lanka, Beijing cemented its “all-weather friendship” with Pakistan by inking $46 billion in energy and infrastructure investment deals. From the Chinese perspective, there have been some significant efforts aimed at mitigating any potential damage to the bilateral relationship as a result of Colombo’s leadership transition. In response to the change, Beijing extended a formal invitation for Sirisena to visit China this past March. The trip, which took place alongside Sirisena’s attendance at the Boao Forum, was clouded by Colombo’s decision to suspend Chinese-led development of the port in Colombo. That decision was a significant blow to Beijing’s plans for a “Maritime Silk Road” and its One Belt, One Road policy that would improve connectivity in South Asia. Meanwhile, India remains concerned about the inroads made by the Chinese in its own backyard. New Delhi is naturally cautious about growing Chinese investments in Mega Projects and infrastructure development projects in Sri Lanka. Moreover, India remains wary of China’s so-called “String of Pearls” and the Maritime Silk Road in which Sri Lanka was earmarked as a hub. India’s anxiety was amplified when the Rajapaksa administration twice facilitated the docking of Chinese submarines in Colombo in September and November 2014. Rajapaksa had reiterated through his election manifesto titled “Mahinda Chinthanaya” that he would follow a non-aligned foreign policy. Yet Rajapaksa’s Sri Lanka was clearly tilted more towards China. A multitude of factors, including hostile policies adopted by the West, pressures exerted by the United Nations Human Rights Council, India’s lack of participation in Sri Lanka’s infrastructure development projects, and the machinations of the Tamil diaspora pushed Colombo towards Beijing. This situation has changed significantly with Sirisena’s election. His state visit to India marked a new chapter in Indo-Lanka relations. The visits came with the ulterior motive of restoring ties between the two countries to a state of “irreversible excellence.” A reciprocal visit by Prime Minister Narendra Modi further strengthened bilateral neighbors. Sri Lankan Foreign Minister Mahanama Samaraweera also went to Brussels in the hope of bolstering ties with the European Union. Discussions held with his Belgian counterpart and with members of the European Parliament focused on Sri Lanka’s compliance with international fishing regulations and the process of re-qualifying for Generalized Scheme of Preferences Plus (GSP+) tariff concessions. U.S. Secretary of State John Kerry’s visit in May to Sri Lanka marked another paradigm shift in Sri Lanka’s foreign policy orientation with the West. 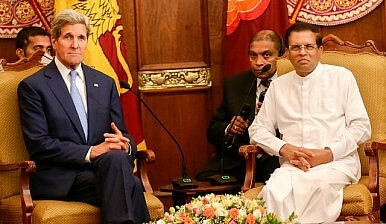 Although Kerry did not pledge much-needed financial assistance to Sri Lanka, he did announce the beginning of an annual bilateral dialogue and insisted that the U.S. would “immediately send experts to advise the new government on economic growth, trade and investment.” Moreover, the two sides agreed to “renew, revive and strengthen relations between the United States and Sri Lanka.” Kerry also cited reconciliation, justice and accountability, advancement of human rights, and strengthening of democratic institutions as four possible areas of U.S.-Sri Lanka cooperation. This growing understanding between Washington and Colombo is to further grow in diverse spheres and will be reinforced by a proposed visit from U.S. President Barack Obama. A senior Sri Lankan Navy delegation landing onboard the U.S. Navy’s aircraft carrier Carl Vinson, off the coast of Sri Lanka a few days prior to Kerry’s visit, was another sign of the renewed military cooperation between the two countries. The next elections will determine whether Sri Lanka opposes or cooperates with the UN Human Rights Council, and whether it aligns with the East or the West. Peshan Gunaratne is an attorney-at-law of the Supreme Court of Sri Lanka and a Visiting Lecturer on International Relations at the University of Colombo. J. Berkshire Miller is a fellow on East Asia for the EastWest Institute. Sri Lanka provides a glimpse of small power-great power relations in a future multipolar world order.